As yoga increases in popularity, more and more new ways to get on your mat to practice have emerged. You can catch a class on YouTube, download lessons on a smartphone application, or sign up for an online yoga subscription. A monthly membership at a yoga studio can get pricey, and it can be hard to always make it there in time for class. Instead of giving up on your practice altogether though, here are four reasons you should give online yoga classes a try. 1. You can practice on your own time. With your busy schedule, it can be tough finding a class at the studio that fits into your day. Some days, you can only fit in a short session, other days you want to stretch, flex, and balance longer. Online classes let you choose any time of day to practice, as well as pick a class in the time range you desire. Just log on to your digital device any time you please and choose a class that ranges anywhere from five minutes to 90 minutes. 2. You can do yoga with world-renowned teachers. Always wanted to attend classes of that teacher you found on Instagram or read about in Yoga Journal? Most yoga teachers with a huge media presence offer classes digitally so they can reach a larger student base. No need to travel to be instructed by your favorite teachers; you can do it in the comfort of your own home. 3. You can pick a class that suits you for that day. So you want to take a Power class after work, but your studio only offers Restorative yoga that night. With online classes, you can pick from a variety styles of yoga that fit how you want to move with your breath on any particular day. 4. You have the ability to pause and reset whenever you want, without missing a beat. There’s always an option to take Child’s Pose at any moment in a live class. Unfortunately, you miss a good portion of the class if you keep taking rests. Just press pause at home and take as long as you need to relax and reset. Take the class at your own pace without worrying about missing any of the postures. Online classes make yoga more accessible to everyone. As long as you have a smartphone, tablet, or computer you can log on and pull some asana anytime, anywhere. With such easy access to a variety of yoga lessons, there’s no reason to ever skip out on your practice again. Do you prefer online or live yoga classes? Do you prefer a mix of both? Share with us in the comments! 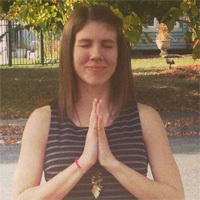 by Kelsey Baier– Kelsey is a yoga student who looks to integrate playfulness and fun into her practice. A practice is not complete without some laughter and smiles. She loves to read fiction, has a major sweet tooth, and is always seeking fun to be had.